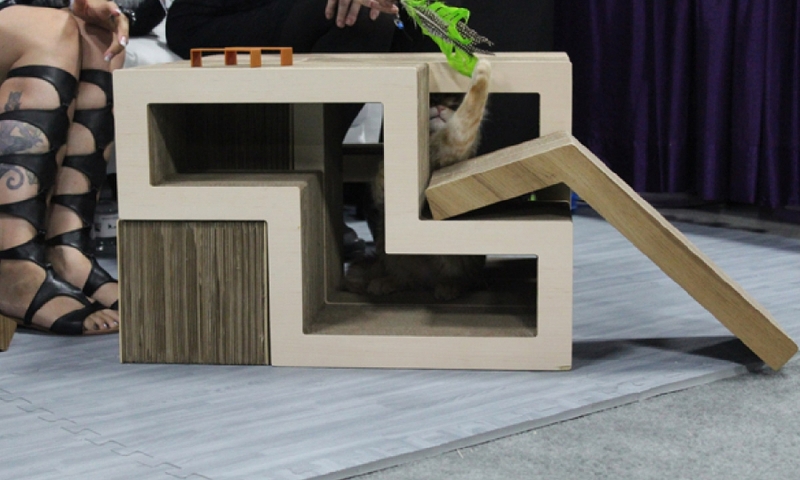 Created by Papercut Lab, KATRIS products put an innovative and ‘green’ twist on ordinary cat furniture. As more consumers are seeking out sustainable as well as multi-use pet products, these new durable, eco-friendly, modular cat furniture collections are made with both cat owners and felines in mind. KATRIS Lynks are only slightly bigger than most regular cat scratchers, but offer better durability, shred-resistant material, and functionality. They are made from heavy-duty paper with stronger flutes and liners (which make up the cardboard structure) than any other cat scratcher brand on the market. In tests, KATRIS Lynks were able to withstand more weight (easily holding over 200 pounds), more scratching-force, and produced significantly less amounts of shredding than other cat furniture. The KATRIS Lynks are modular, so they can be placed and rearranged in many different combinations and builds – either on their own, or in combination with KATRIS blocks. KATRIS Lynks have real wood covers on their sides, making them look stylish and desirable for consumers’ homes, as well as protecting the pads from wear and tear. Thanks for inctoduring a little rationality into this debate.